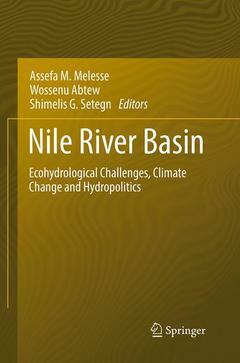 Coordonnateurs : Melesse Assefa M., Abtew Wossenu, Setegn Shimelis G.
The book provides a comprehensive overview of the hydrology of the Nile River, especially the ecohydrological degradation and challenges the basin is facing, the impact of climate change on water availability and the transboundary water management issues. The book includes analysis and approaches that will help provide different insights into the hydrology of this complex basin, which covers 11 countries and is home to over 300 million people. The need for water-sharing agreements that reflect the current situations of riparian countries and are based on equitable water- sharing principles is stressed in many chapters. This book explores water resource availability and quality and their trends in the basin, soil erosion and watershed degradation at different scales, water and health, land use and climate change impact, transboundary issues and water management, dams, reservoirs and lakes. The link between watershed and river water quantity and quality is discussed pointing out the importance of watershed protection for better water resource management, water accessibility, institutional set-up and policy, water demand and management. The book also presents the water sharing sticking points in relation to historical treaties and the emerging water demands of the upstream riparian countries. The need for collaboration and identification of common ground to resolve the transboundary water management issues and secure a win-win is also indicated. Part I: Hydrology and Water Availability.- The Nile River Basin.- Streamflow Data Needs for Water Resources Management and Monitoring Challenges: A Case Study of Wami River Sub-basin in Tanzania.- Satellite Rainfall Products and their Reliability in the Blue Nile basin.- Africa-Wide Monitoring of Small Surface Water Bodies Using Multi-Source Satellite Data: A Monitoring System for FEWS NET.- Surface and Ground Water Resources of Ethiopia: Potentials and Challenges of Water Resources Development.- Land and Water in the Nile basin.- Part II: Soil erosion and Water Quality.- Soil Erosion and Discharge in the Blue Nile Basin: Trends and Challenges.- Spatial and Temporal Patterns of Soil Erosion in the Semi-humid Ethiopian Highlands: A Case Study of Debre Mawi Watershed.- Modeling Sediments Dynamics: Effect of Land Use, Topography and Land Management in the Wami-Ruvu Basin Tanzania.- Assessment of Soil Erosion in the Blue Nile Basin.- Hydro-epidemiology of the Nile Basin: Understanding the Complex Linkages between Water and Infectious Diseases.- Part III: Lakes and watersheds.- Monitoring State of Biomass Recovery in the Blue Nile Basin Using Image Based Disturbance Index.- Bathymetry, Lake Area and Volume Mapping: A Remote Sensing Perspective.- Land Use and Land Cover Changes in Northern Kordofan State of Sudan: A Remotely-Sensed Data Analysis.- Multi-Model Approach for Spatial Evapotranspiration Mapping: Comparison of Models Performance for Different Ecosystems.- Modeling Rainfall Erosivity from Daily Rainfall Events, Upper Blue Nile Basin, Ethiopia.- Part IV: Climate Change and Water Resources.- Climate Change Impacts and Development Based Adaptation Pathway to the Nile River Basin.- Climate Change Projections in the Upper Gilgel Abay River Catchment, Blue Nile Basin Ethiopia.- Climate Change Impact on Water Resources and Adaptation Strategies in the Blue Nile River Basin.- Climate change and Rangeland Degradation in Eastern Sudan: Which Adaptation Strategy Work Well?.- Statistical Downscaling of Precipitation in the Upper Nile Use of Generalised Linear Models (GLMs) for the Kyoga Basin.- Local and Indigenous Knowledge Systems in Subsistence Agriculture, Climate Risk Management and Mitigation of Community Vulnerability in Changing Climate, Lake Victoria Basin: Case Study of Rakai and Isingiro Districts, Uganda.- Part V: Water Accessibility, institutional setup and policy.- Processes of Institutional Change and Factors Influencing Collective Action in Local Water Resources Governance in the Blue Nile Basin of Ethiopia.- Water Governance in the Nile Basin for Hydropower Development.- Managing Rainwater for Resilient Dryland Systems in SSA: Review of evidences.- Part VI: Transboundary Rivers, Water Sharing and Hydropolitics.- Impact and Benefit Study of Grand Ethiopian Renaissance Dam (GERD) during Impounding and Operation Phases on Downstream Structure in the Eastern Nile.- Transboundary Rivers and the Nile.- International Water Law Principles and Frameworks: Perspectives from the Nile River Basin.- Supporting the Development of Efficient and Effective River Basin Organizations in Africa: What Steps Can Be Taken to Improve Transboundary Water Cooperation Between the Riparian States of the Nile? - Part VII: Watershed Services and water management.- Payment for Watershed Services in the Mara River Basin: Part I - Institutions and Stakeholder Engagement.- Payment for Watershed Services in the Mara River Basin: Part II - An Analysis of Stakeholders' Perceptions and Willingness to Implement.- Climate Teleconnections and Water Management.